LONG ISLAND CITY — The two luxury towers replacing former street art mecca 5Pointz will have an indoor pool and graffiti-style artwork scattered throughout, new renderings show — and the buildings will bear the 5Pointz name, a move the artists who used to paint there decried as disrespectful. The buildings rising at Jackson Avenue and Davis Street will offer amenities like a business center, fitness room and a lounge with 14-foot-high ceilings, according to Mojo Stumer Associates, the firm designing the project's interiors on behalf of developer G&M Realty. Renderings provided by the firm — which were first published by Curbed New York — show graffiti-style artwork hanging at various spots throughout the future towers, filling a wall behind a staircase or next to a seating area. "The client requested that graffiti artwork be incorporated throughout the interiors to reflect back on the history of the 5 Pointz neighborhood," Mojo Stumer Associates said in a statement. 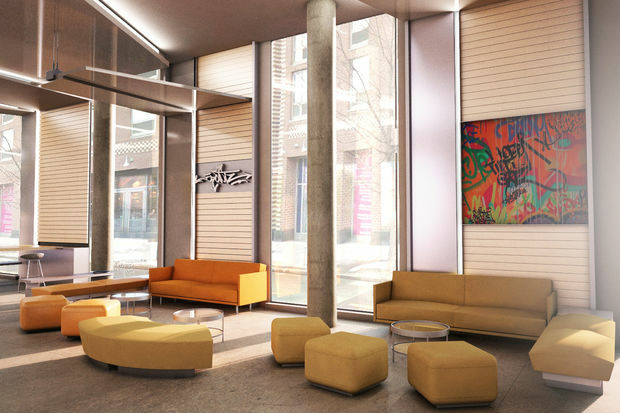 The renderings also show an "engraved graffiti logo" of the 5Pointz name behind the reception desk, in a style similar to one the 5Pointz artists have used. Several of those artists are currently suing G&M Realty to get compensation for the art that was painted over in 2013, when the developer whitewashed the former buildings. "The disrespect continues," Marie Cecile Flageul, a spokeswoman for the artists, said when asked to comment on the building plans. "To the 5Pointz community, for him to name the building 5Pointz and to use a mock-up of a logo of ours, we feel the disrespect continues." But Jerry Wolkoff, who runs G&M Realty alongside his son David Wolkoff, said the logo the building will ultimately use will be different from the one in the renderings, and insisted he has a right to use the 5Pointz name on his project. "5Pointz was my building. The building was known as 5Pointz, not an individual," Wolkoff told DNAinfo New York Friday. He said he allowed the artists free reign to paint on the now-demolished warehouses he used to own at the site, and that the group knew for years he would eventually tear them down to develop the property. "It's my building, and I let them express themselves for 25 years," he said. "I loved what they did. I have no animosity." He said he plans to invite street artists back to paint at the site when the new buildings are finished. The project is slated to include space for artists' studios. "I'm bringing back artists," he said. Wolkoff said the new buildings — which will include just over 200 affordable units out of its approximately 1,000 apartments — will also include game rooms with shuffleboard and pool tables, among other perks for tenants. "We have almost anything that you want to think of for an amenity," he said. The buildings are expected to open at the end of 2018.